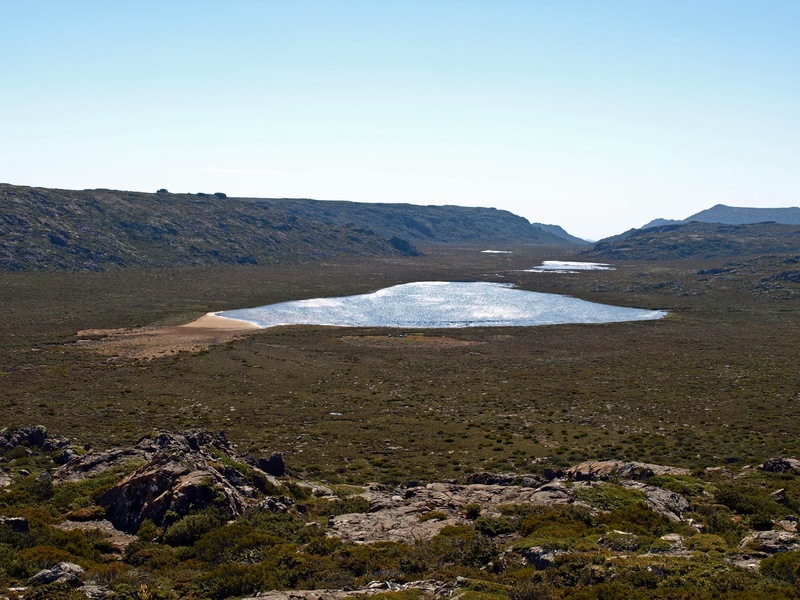 Travel Tasmania’s Midland Highway between Launceston and Hobart, and only fog – real or metaphorical – will stop you from noticing the Ben Lomond plateau. It vaults above the relatively flat northern midlands, a dolerite island more than 18 000 hectares in area, most of it over 1300m above sea level. From the highway its southern edge, Stacks Bluff (1527m), looks like a giant loaf looming over the Fingal Valley, its enormous dolerite slices seemingly caught in a frozen topple. 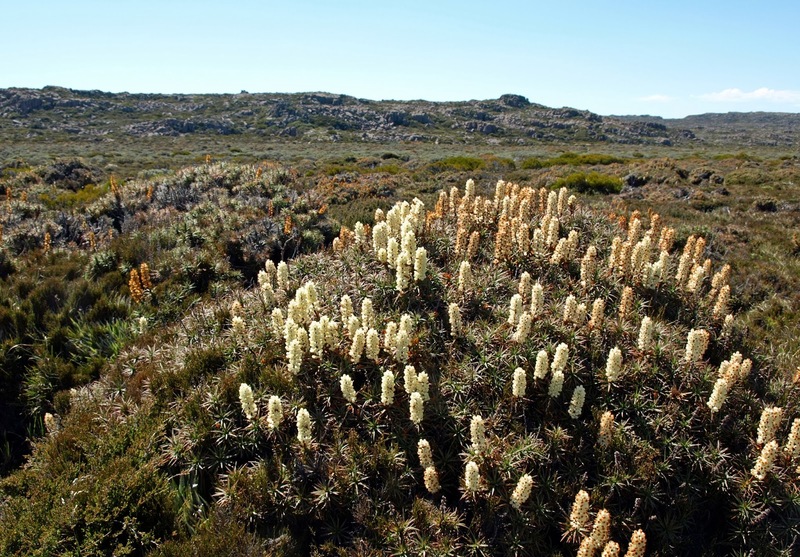 At its northern end the plateau tops out at Legges Tor, at 1572m Tasmania’s second highest point. The plateau is named after the Scottish Ben Lomond: Beinn Laomainn in Gaelic, (which translates as “Beacon Mountain”). It sits above the eastern shore of Loch Lomond, in the south of the Scottish Highlands. 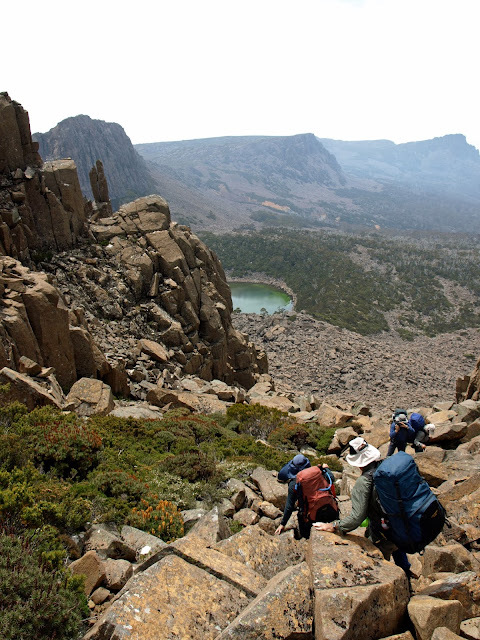 At 974m it is nearly 600m lower than its Tasmanian namesake. Scots do homesickness well, having also “found” Ben Lomonds in New Zealand, California and Trinidad. During the 1980s I had seen plenty of the northern part of “our” Ben Lomond, as I scrambled around Legges Tor and the nearby crags, and snow-played on its ski slopes. I’d missed out on trips to Stacks Bluff, though I knew plenty who had been there. Curiously I knew no-one who had ever walked the length of the plateau, just a few skiers who had done the nearly 30km return run as a day trip. I began to ponder what it would be like to walk through that high country for a couple of days. 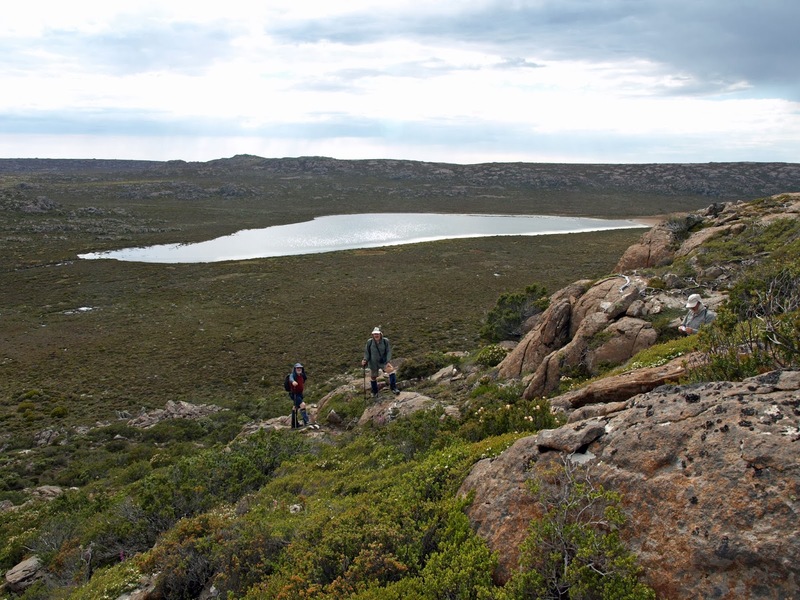 I’d walked and camped at altitude in Tasmania many times. But in my experience most of our country above 1400m is narrow, steep and peaky. 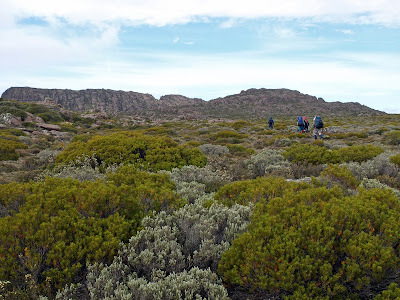 You pick your way up and around boulder fields, through steep, scrubby creeks, over high, ruckled moors. But the Ben promised to be wide open and big-skied. 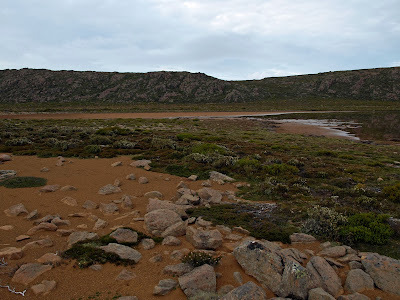 I wondered if it might be a little like the Central Plateau, although few sections of that are much above 1200m. 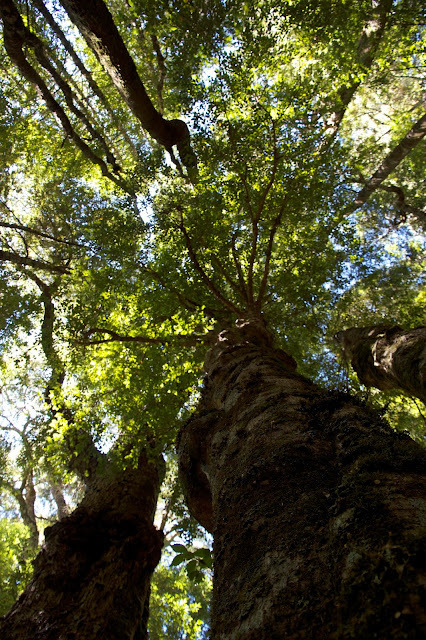 And the extra altitude of Ben Lomond robs it of two of the Central Plateau’s features: trees and substantial lakes. 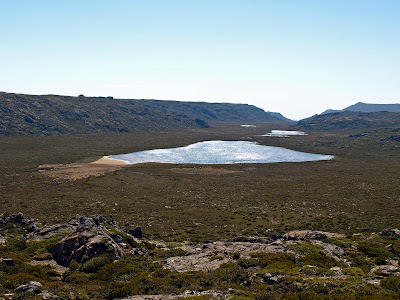 I next thought about other large, flat-topped mountains in Tasmania, like Mt Massif on the Du Cane Range, and the Olympus Plateau above leeuwuleena/Lake St Clair. They certainly reach similar altitudes to the Ben, and are substantially above the tree-line. But next to Ben Lomond they are pygmy’s knuckles to a giant’s fist. Ten minutes walking would see you across Massif, and even the longest section of Olympus would take only a few hours. To traverse the Ben Lomond plateau would take near enough to two days of walking. It promised to be a high walk in a league of its own. So to the research. I needed to consider where to start and finish, where to camp, and the state of walking tracks. The last was the easiest to answer. What walking tracks? Between the ski field and Stacks Bluff there was no regular track, just some ski poles at the start of a cross-country trail that was now rarely used. On the other hand there was no forest, and supposedly little scrub. It looked like being an open, off-track alpine ramble. Transport was another “interesting” consideration. From the ski field road to the road beneath Stacks Bluff was about 130km by road, yet hardly 15km on foot. We decided on a car shuffle, with cars to be left near Storeys Creek, beneath Stacks Bluff, and at the Ben Lomond ski field. Is it ever quick and easy coordinating walkers from both ends of the state, meeting up, organising tents and food, doing a car shuffle, and finally getting to the actual start of the walk? When you also take a “long-cut” there (aka getting lost), it should be no surprise if you don’t get as far as planned on the first day. In reality we didn’t get away until very late in the afternoon, in very hot late-January sunshine. We followed the ski poles for the first short while, but very soon we were sweating and huffing as we picked our way, on a rough compass setting, through low but surprisingly persistent scrub. We were to skirt a little east of a straight line between the ski field and Stacks Bluff, roughly down the Meadow Vale. This was to help us avoid thicker scrub between Giblin Fells and the scarily-named Little Hell. Regardless one of our party was soon struggling with the heat and a lack of walking fitness. When he stumbled and fell, we thought it best to camp wherever we could find water and a flattish spot. 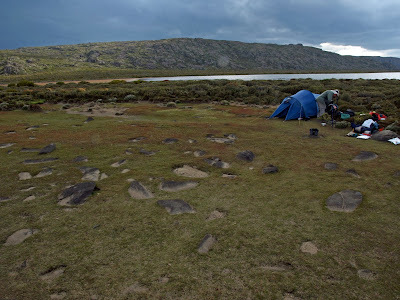 You know you’re staying somewhere original when there are no signs of humans even around a water source; when your tents sit on thick, springy vegetation; and when the local invertebrates are curious enough that they come right into your tent for a good look. The next day started warm and still, and promised to grow hot. We checked the map, did our best to guess the least scrubby route, and set off towards Lake Youl. The plan was to camp there for a few days, explore the southern end of the plateau, then descend via Stacks Bluff. You have to grant that scoparia, while best avoided, does offer compensations to its prisoners, at least at this time of year. After some close-up views of scoparia, and some artful dodging of more, we climbed up a small rise and there was the lake. Lake Youl is a large, shallow lake trending north-west to south-east. It’s shaped roughly like a funnel, which is apt given that the strong winds have concentrated wave action so heavily here that there are pebble dunes at the lake’s southern end. These extraordinary features rise more than a metre above the shore of the lake, providing the only hope of a sheltered campsite. Having settled into the campsite before lunch, we spent the afternoon splashing about in the lake. I would have said swimming, but that would have required water deeper than the 20cm we found, even 100m from the “beach”. Late in the afternoon clouds piled up and blackened around us. 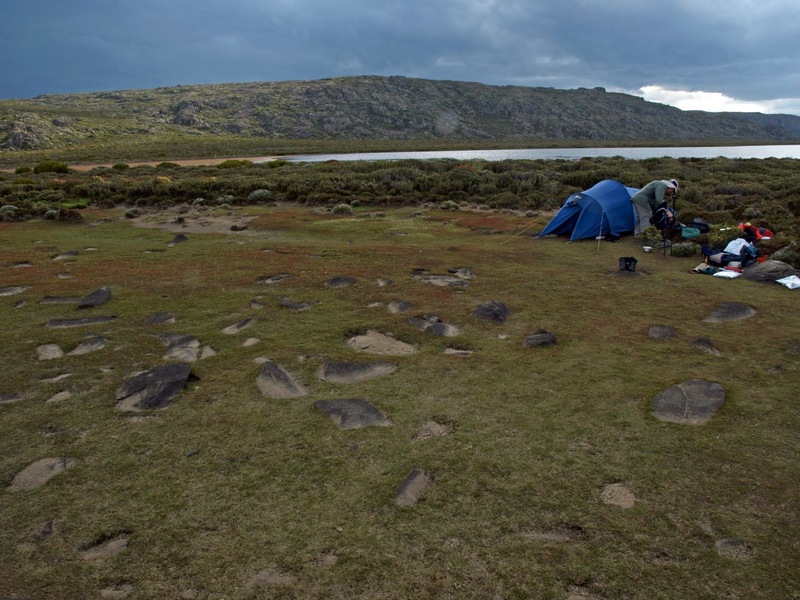 Lightning, thunder and squally showers sent us to our tents for a time, but these cleared in time for dinner and another “swim”. The wind dropped away as well, undoubtedly a good thing given the evidence of its strength here in the form of wind-blown pebbles and rocks all around us. Is this the future? I am sitting in Sydney’s airport having a desultory conversation with a young Australian of Indian descent. He’s on his way to visit family in Calcutta. We speak of the usual things: travel, work, family. He lives in Sydney, and loves it for its shopping. But being temporarily out of work in the IT industry here, he’s off to work for his uncle back in India. I ask him about Calcutta, and he describes a vibrant, busy city that’s "great for shopping". I quiz him about India’s wilder parts. He has been to the Himalayan foothills a couple of times. But he feels quite uncomfortable in the countryside (and here he gives a little shudder). He doesn’t care to be long away from the city’s bustle … and its shopping. He asks about Tasmania. I tell him about its mountains, its beautiful wild places, its relaxed life-style. When he asks about its shopping scene, I have to disappoint him. “You wouldn’t come to Tasmania just for its shopping.” He nods, and turns to his smart phone for a facebook fix. Have I struck an unusually shopping-obsessed, nature-phobic character? 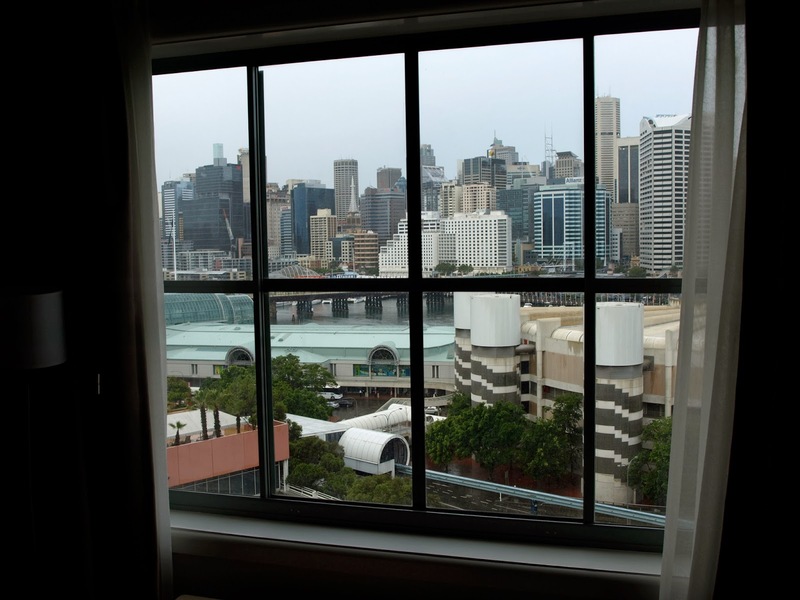 A few days in Sydney incline me to think him not atypical: that this may be the shape of the future. Retail therapy, device-addiction and a deep fascination with “stuff” are on show everywhere in Australia’s biggest city. They all point in the same direction: many of us prefer the worlds of our own creation to those of nature. I disembark a ferry in Cockle Bay, near Darling Harbour. There is not the slightest chance that a cockle could live here any more. 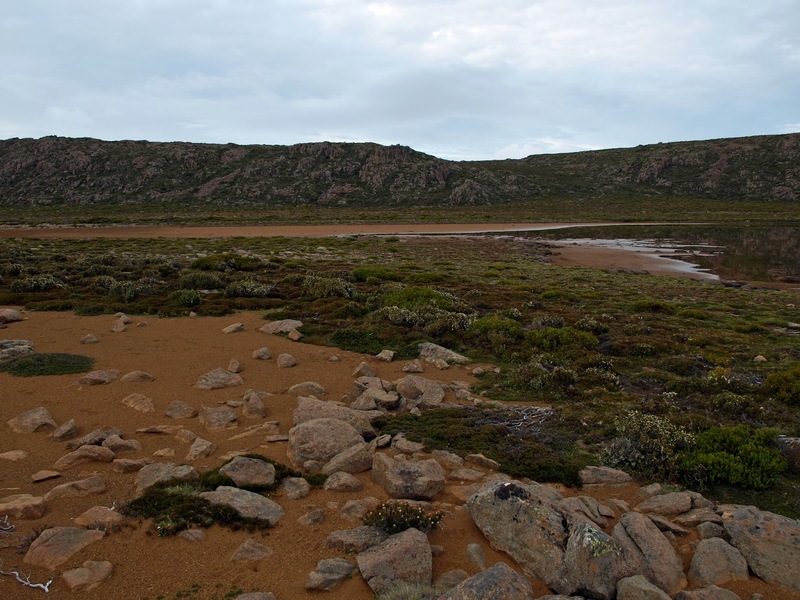 There is no bay, no natural shoreline, no rocky coast: in short no habitat for the life form that gave this place its name. All is tarred and tamed to the service of commerce. 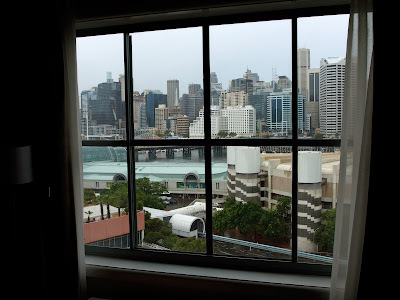 A few days later I am back home, ruminating on my Sydney visit and listening to some J.S. Bach. 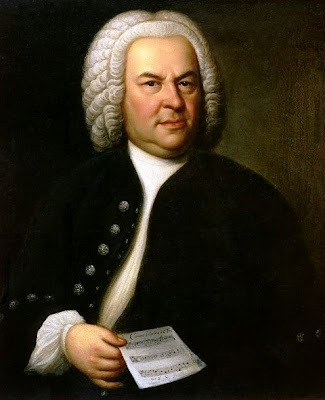 I've heard that some 200 years ago, at about the same age as my young Indian Australian, Bach walked 260 miles (420 km) across Germany to hear and learn from the famous organist/composer Dietrich Buxtehude. I suppose the young have always travelled for inspiration and the prospect of work. But which of us would have done it all on foot? And what have we lost in our ability to travel quickly and easily; to stay in touch instantly; to gather information in seconds rather than months or years? We know little detail of the 20 year old Bach’s journey, so I can only conjecture. I see him with a staff in his hand, a satchel over his shoulder. He wonders about his life as he moves from village to town, from city to hamlet. His head is full of creative thoughts, ‘though he is still two years away from publishing his first musical work. It is winter, cold and wet, and the young Bach can’t always find or afford dry shelter. He sees – and feels – the rain, fog, snow and sometimes sun. He watches the sky, sees the birds, the tracks of animals in the snow. Is that a wolf he hears? Whatever else his journey encompassed, it gave Bach a real and constant exposure to the natural world (what he would have called God’s creation) as well as the social order. While Bach may have become a singularly extraordinary composer, his experience of travel – and of the natural world – was commonplace for his time. Is it any wonder that Bach, a devout Lutheran Christian, repeatedly – and brilliantly – invoked God’s creation in his subsequent compositions? Were Bach to write a letter to the current generation, I am sure that faith would figure prominently. But I suspect the letter might also suggest that we get outside and experience creation a little more often; that it is no bad thing to be overawed by its wonders. I wonder would it be too much to ask him to also put his ideas in a facebook status update?